This website has been built to provide you with information about my Safe Living private coaching and consulting practice. Here you will learn about my work and the services I offer. 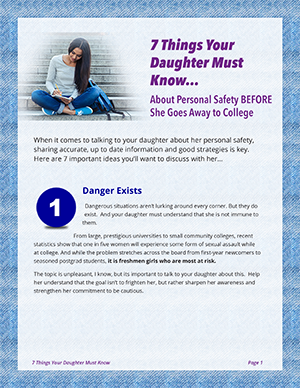 In addition, you will find resources to keep you abreast of everything you’ll need to make smart, informed decisions about your safety and the safety of your family. Though my work includes programs for adult women, men, teen boys and children, those who benefit most are teenage girls. When the topic is sexual assault, young women are the most targeted of all populations and the least prepared to handle it. Because of this, you will find a complete section of this website devoted exclusively to programs for teen girls and college women. My basic services include customized private lesson programs, specialty workshops and small group lecture presentations. These programs can be arranged for individuals, families or organizations. Information on these services can be found throughout the website. Additionally, this site includes my blog where I answer questions, post original work and attempt to shed light on the often inaccurate, misleading or obsolete “conventional safety wisdom” that dominates the media today. I also publish a monthly newsletter especially for parents of teenage girls called “Safe Living.” Click here to subscribe and I’ll send each new edition straight to your inbox. Finally, if you would like to contact me, you can email, mail or call. Just click here to go to my contact page.